ALTHUYSEN, Jan and Gysbert JAPIX (JAPIKS, JAPICX). 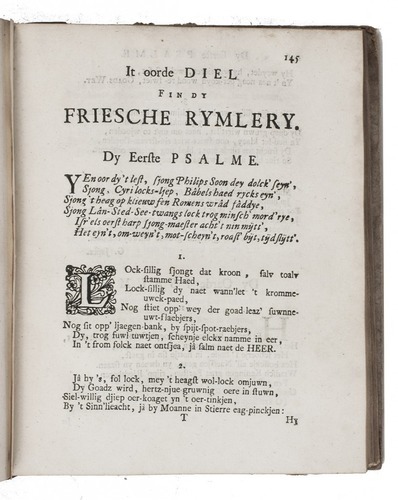 Friesche rymlery, yn twaa dielen bystaende, wier fin it eerste bystiet yn forjyerings rymmen, brullofts rymmen, forstaerrings rymmen, in mingel rymmen; it oorde diel bystiet uwt dy 150 Psalmen fin David mey dy oore lôfzangen. Leeuwarden, Wyger Wygers, 1755. 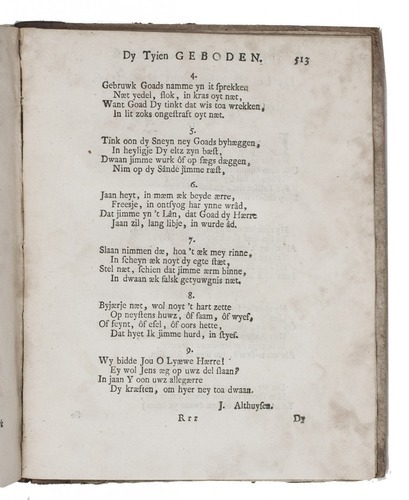 2 parts (with continuing pagination) in 1 volume. 4to. 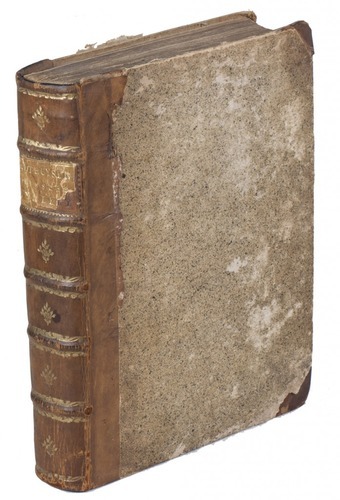 Contemporary half calf, gold-tooled spine. 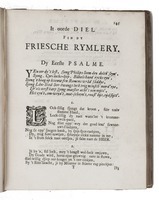 First edition of Jan Althuysen's collection of Frisian poetry, a successor to Japix's acclaimed similarly titled Friesche rymlerye of 1667. 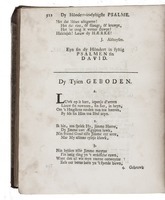 The collection is divided in two parts: the first containing various poetry by himself, his father and a few others; the second part is the first complete Frisian translation of the psalms, including the selection of psalms translated by Japix published earlier, supplemented with the translation of the other psalms by Althuysen. 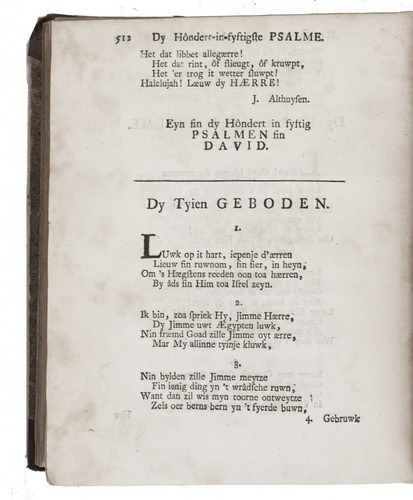 This translation of the psalms got him in trouble with the religious authorities, because he didn't had asked for permission of publication in advance. When in 1500 the Duke of Saxony annexed the present-day province of Friesland, Low German became the language of administration and after 1550 no official documents were found any longer in Frisian. Dutch soon became the dominant language. 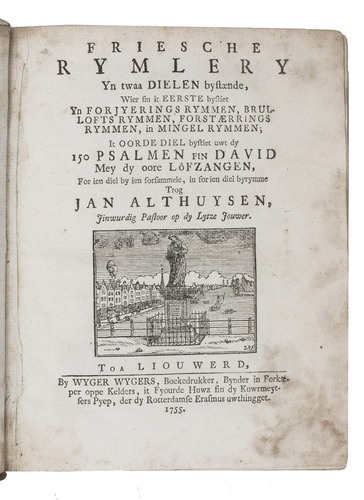 In the 17th century only some four books were published that were entirely written in Frisian. 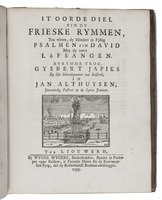 The most important one was Friesche rymlerye (1667), by Gysbert Japix, which in its extended second edition of 1681 included the first grammar of Frisian. 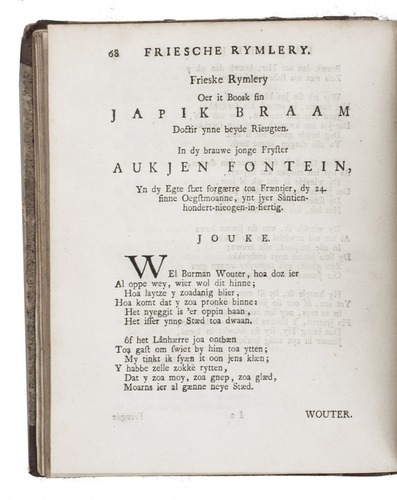 Since the revitalisation of Frisian literature during the Romantic period in the nineteenth century, Japix has received much scholarly attention. 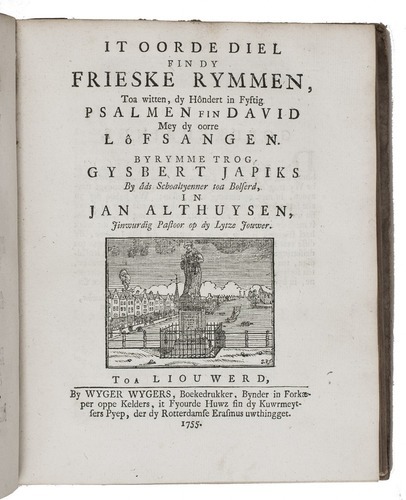 It is believed his work takes in a crucial position in the linguistic and literary development of the Frisian language. Today Friesland's main literary prize is named after him. 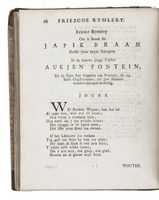 With 6 lines added in contemporary manuscript to the laudatory poem by Jan de Kruyff, signed "JR". With waterstains in the fore-edge margins (primarily in the opening and final leaves), binding worn, otherwise in good condition. 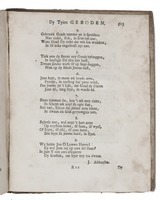 K. Dykstra, Lyts hânboek fan de Fryske literatuer, p. 27; NNBW II, cols. 20-21; cf. Bremmer, "The first Grammar of Frisian" in: Diversions of Galway (1992), pp. 59-71.